With the American Pride program at Hospice of Dayton, veterans receive benefits and support that acknowledges their services and sacrifice. By recognizing the unique needs of our nation’s Veterans who are facing a life-limiting illness, Hospice of Dayton is able to accompany and guide Veterans and their families towards a more peaceful ending. We can help assure access to all the benefits to which a veteran is eligible, provide spiritual support and address individual post-traumatic stress issues. We were among the first in the country to achieve national recognition from the National Hospice and Palliative Care Organization and Department of Veterans Affairs as part of the We Honor Veterans program. Through participation in Honor Flight, veteran pinning ceremonies and special observances and celebrations, we celebrate the lives of veterans and honor their contributions. 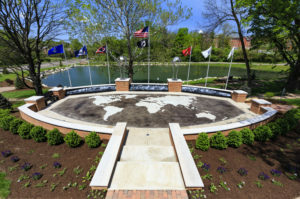 The American Pride Veteran Memorial at the Ohio’s Hospice of Dayton Hospice House , 324 Wilmington Avenue in Dayton, is a moving commemoration that includes illustrated panels dedicated to American military campaigns ranging from the Revolutionary War to the War Against Terror. Each branch of the service is represented with a flag, and the American flag flies proudly at the center of the display. The memorial also includes a computer kiosk that features pictures and stories about veterans. By clicking here, community members can enter their own stories or stories about loved ones, and upload photos of Veterans, honoring their lives and service. All stories submitted will be accessible online and on display at the American Pride Veteran Memorial. The stories are searchable by name. Any Veteran from the Miami Valley region is eligible to be included. Contributions to support the American Pride Veteran Memorial and mission of Ohio’s Hospice of Dayton can also be made by clicking here.